If you’ve ever lived in a wet climate, you know how important rainboots are.In a lot of places, they don’t just keep your feet from getting wet, they’re a way of life. You’ll also know that a good pair of rain boots can be the difference between a good day and being miserable. It’s always better to invest in a really good pair of rain boots. They tend to be made better, have better soles, and thicker materials. These keep you warmer, drier, and safer. 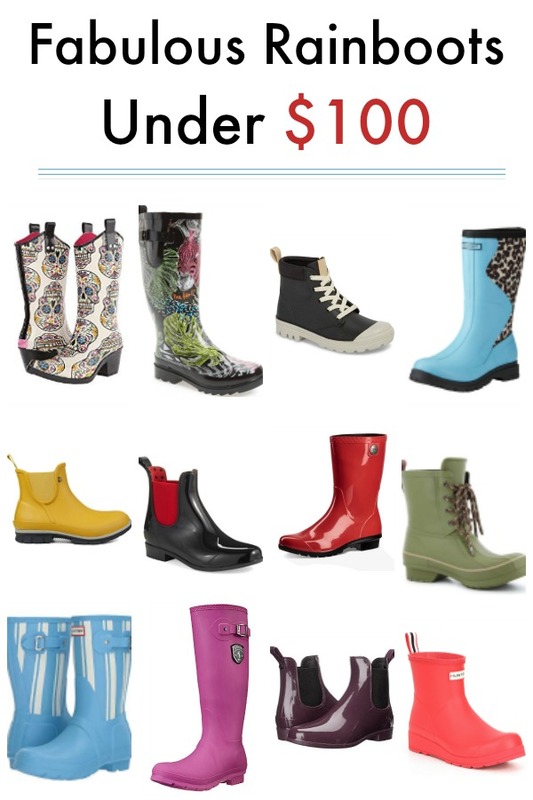 We’ve rounded up some of our favorite ladies rainboots that are under $100 from around the internet. Links may be commissioned. M&F Western Roxy – I’m a sucker for a cowboy boot, and these cowboy boot inspired rain boots are a great option. The sugar skulls are a great nod to Day of the Dead, and perfect for fall or adding a little edge to your wardrobe. They’re also available in black. 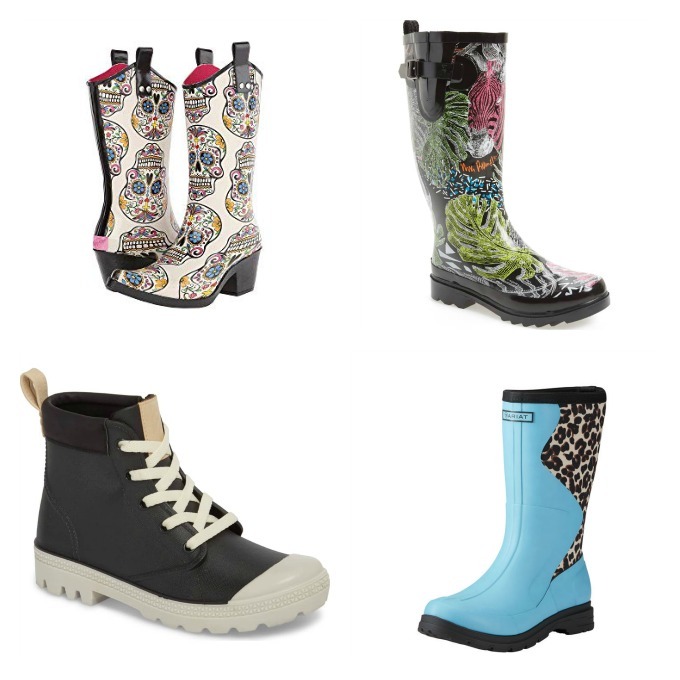 Sakroots Rhythm Waterproof Rain Boot – A traditional style tall rain boot with such fun prints. I’m partial to the Black Wild Life Print myself, but there’s a pattern for every aesthetic. The jersey lining and padded insole makes them comfortable to wear, too. Dav Melrose Sneaker Boot – These totally look like old school Converse All Stars. The lace up boots make getting these on and off a breeze and are a totally fresh look in rain boots. One caveat – many reviews say they run small, so you might want to order a size or two up. How fun are they? Ariat Springfield Rubber Boot – I love the two-tone effect of these rain boots. The zig-zag is a fun design feature that adds a little interest and doesn’t look like just another boot. Plus, the colors and patterns are really fun. I’m partial to the aqua/cheetah pair myself. Bogs Amanda Plush Slip On Boots – Amanda is a great rainboot choice for colder days. The plush lining helps keep your feet warm to -13 degrees F. Not only that, but they also have special technology to help combat foot odors. Pair this with a gel cushioned insole and a rugged outsole, these Amanda Slip On Boots from Bogs will become your go-to. Available in 4 fun colors. They’re also available in an unlined version. Lauren Ralph Lauren Tally Rain Boots – Animal print is always a great choice for accessories, and rain boots are no exception. The low booties and elastic gore make for easy on-easy off wearability. Also available in a stunning black patent with a red elastic gore. So chic! Animal print available here. And other colors available here. Ugg Sienna Shearling Lined Rainboots – How pretty are these? Gorgeous glossy shades are lined with Ugg’s namesake shearling to keep your feet warm and cozy. 10 fashion forward colors and being well under $100 make this a must have rain boot for fall and winter. 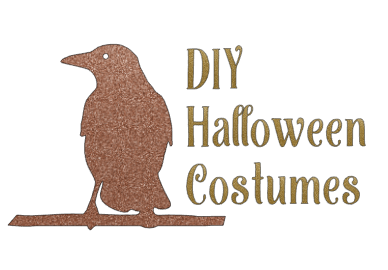 Additional colors available here. 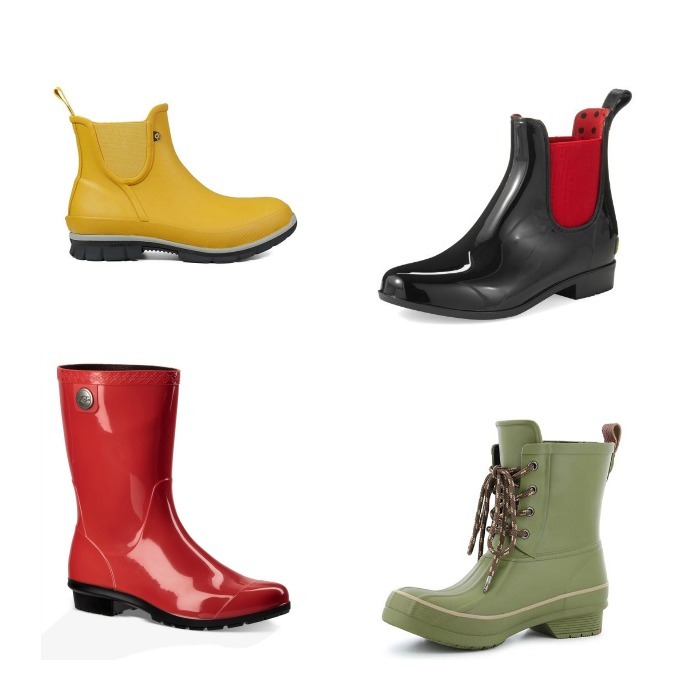 Chooka Classic Rain Duck Boots – These are a classic for outdoorsy folks, made in fun fashion colors. These lace up, but the tongue is fixed in place, so slightly they’re adjustable. The duck boots are easy to clean if they get dirty – just hose ‘em off. Available in red and black, too. Hunter Garden Stripe Short Rain Boots – I can’t resist stripes. These striped rainboots from Hunter are a perfect transitional piece. They have all the great quality and craftsmanship from Hunter we’ve come to know and love with some extra style. Kamik Jennifer Waterproof Tall Rainboots – These are so great. They remind me of the fab Hunter rainboots, but at a friendlier price. There’s a ton of colors, and they have great reviews. These aren’t lined for winter, so you’ll probably want to pair with a fleece liner or some great wool socks for colder climates. You might want to size up. Sam Edelman Tinsley – Another short bootie with a large elastic gore. However, the Tinsley comes in 7 shades – 3 glossy and 4 mattes. Each glossy shade has a matte counterpart, and they are oh so fab for fall. At this price, you’ll want to grab a couple pairs. 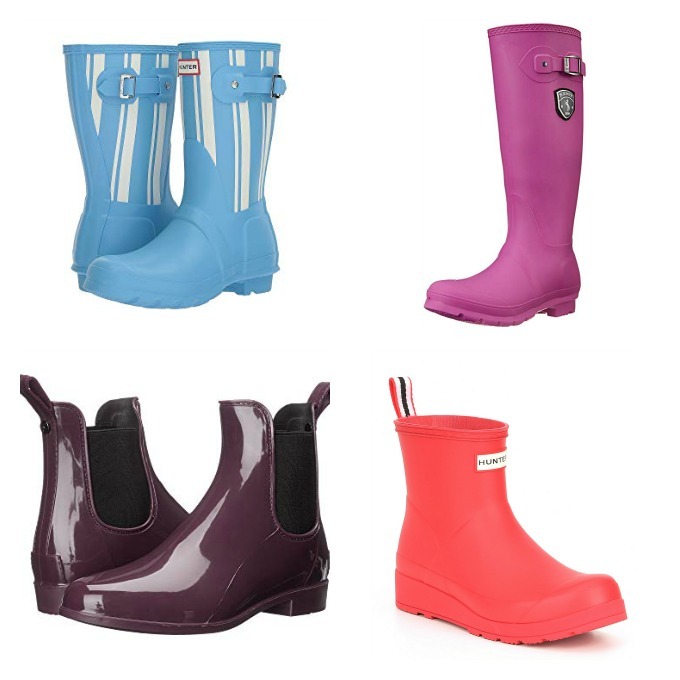 Hunter Play Short Rain Boots – These are so cute! They’re super low rain boots that look just like the traditional tall Hunter rain boots. They kind of remind me of kid’s rain boots, with the fun colors and styling. So adorable! Aren’t these designer rainboots great? Tell me, which ones are your faves?